Jerome “Jerry” Seinfeld was born in Brooklyn, NY, on April 29, 1954, to Kalman Seinfeld, a signmaker, and his wife, Betty; Jerry was the second of the couple’s two children. The Seinfeld family moved to Long Island when Jerry was a child, and he spent most of his youth there. After graduating from high school, Seinfeld went on to college, first attending the State University of New York at Oswego, and then moving on to Queens College of the City University of New York, where he received a Bachelor’s Degree in 1976. Seinfeld developed a keen interest in performing while in college (his degree from Queens was in communications and theater), and after graduation he began working New York comedy clubs, often without pay, while holding down a number of odd jobs. Seinfeld’s first big break came when his bright but understated observational humor caught the eye of standup legend Rodney Dangerfield, who featured Seinfeld on a special for HBO. The exposure helped establish Seinfeld on the comedy club circuit, and won him a recurring role on the situation comedy Benson. However, Seinfeld and the show’s producers clashed over the character’s direction, and he was fired after only four episodes. In 1981, Seinfeld appeared for the first time on The Tonight Show, then hosted by Johnny Carson, and made a strong impression on both the audience and the host; he became a frequent guest on the Carson show, as well as David Letterman’s late-night talk show. As Seinfeld’s fame began to rise, he starred in several cable TV specials, and was approached to star in several TV series. However, remembering his experience on Benson, Seinfeld opted to avoid episodic television unless he was in a position of greater control (though he did do occasional guest spots on sitcoms and played a small role in Danny De Vito’s TV movie The Ratings Game). In the meantime, Seinfeld and his good friend Larry David began working up an idea for a situation comedy to be called The Seinfeld Chronicles. In 1989, NBC took the bait, and a year later the show premiered under the streamlined name Seinfeld. Concerning standup comic Jerry Seinfeld and the often odd everyday occurrences of his circle of friends (many of whom were based on people Seinfeld and David knew in real life), Seinfeld got off to a slow start, but began to win a healthy audience in its second season, and in time became one of NBC’s biggest hits, until Seinfeld and David opted to end the show at the peak of its popularity in 1998. Unlike most stars of top-rated television shows, Seinfeld displayed no interest in moving into films, and instead returned to standup comedy shortly after his show went off the air with a sold-out concert tour. In the Spring of 2002, however, Seinfeld did sign a deed to appear in a documentary about his return to the comedy circuit with a new act. In his personal life, during the height of his fame, Seinfeld was romantically linked with several women (including comic and writer Carol Leifer, fashion designer Shoshanna Lonstein, and writer Jennifer Crittenden) before marrying Jessica Sklar, a publicist who met Seinfeld only a few weeks after her marriage to Eric Nederlander in 1998. Seinfeld and Sklar wed in December of 1999, and their first child, daughter Sascha, was born on November 7, 2000. Do you want to hire Jerry Seinfeld? Directly request a quote. In 48 hours we can send you the availability of Jerry Seinfeld If you would like to book Jerry Seinfeld, Entertainment Booking Agency is the right place. 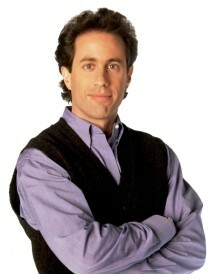 We will offer you the best price and contact the management or we directly contact Jerry Seinfeld. For corporate appearances or speaking engagements you can contact our agents and the will help you true the process. Tags: hire Jerry Seinfeld, Jerry Seinfeld booking, book Jerry Seinfeld, Jerry Seinfeld appearances, find more information on booking Jerry Seinfeld for appearances, Jerry Seinfeld speaking engagements, Jerry Seinfeld endorsements/spokesperson, Jerry Seinfeld appearance fees, Jerry Seinfeld booking agency contact info, biography of Jerry Seinfeld, Contact an artist booking talent agent find a speakers bureau that can book Jerry Seinfeld, speaker booking agency for Jerry Seinfeld, Jerry Seinfeld booking agency, Jerry Seinfeld booking for corporate event. EBA is one of the biggest entertainment booking agencies in the World. We book hundreds of celebrities, artist, athletes and speakers in a year. Important to know is that we are not claiming to be the management of Jerry Seinfeld. We are not the official agent for Jerry Seinfeld. Companies from around the globe book these artists and speakers true our company be course we have one of the biggest networks and we always have direct contact with the artist or the management. We help you to find the right celebrities for your corporate of private events. Please contact one of our agents to get free advice and we will help to get the world-famous artist on your party.